Use our Dedicated Server Hosting FAQ to find answers to commonly asked questions. Should you have any additional questions, please Chat Now with our technical sales team or leave us a message below and we’ll get back to you! How many mail accounts can I have on my server? You are able to create as many IMAP or POP email accounts as you would like! Features such as Auto-Responders, Forwarding and Aliasing are also unlimited. All servers currently use Exim to send and receive email. Do I need a special email client? No, any POP3 or IMAP email client should interface with your mail server. We provide cPanel free to make email account creation fast and easy. Our support articles walk you through moving emails to your Dedicated Server and if you need assistance, our support staff is always available. Root Access on our Dedicated Servers can be easily requested and granted within seconds through AMP (Account Management Panel) once your account and server are fully provisioned. Our support article provides step-by-step instructions on requesting Dedicated Server Root Access. What happens if I run out of storage space on my SSDs or Hard Disk Drives? We offer several storage drive upgrades to choose from. You have the ability to upgrade your server with backup drives for storing local backups, additional drives used to quickly increase your available storage space or swap out your primary drives for larger capacity drives. You also have the option to choose from SSDs (solid-state drives) or HDDs (hard disk drives). Keep in mind that while SSDs are faster and higher performing than their HDD counterparts, most seeking very large capacities would choose HDDs. As always, Chat with our Technical Sales Team to get recommendations on a solution that fits your needs! What kind of connection will my server have to the Internet? Regardless if you choose our High Performance Dedicated Servers or our Commercial Class Dedicated Servers, we include 1 Gbps NICs at no additional charge. Our network is fully redundant with multiple high-bandwidth links from our ISPs and designed to provide lower latency and higher transfer rates. Each server has a set amount of bandwidth that can be used each month. We only count outgoing bandwidth. Incoming bandwidth would not be counted against your monthly usage and we include 1 Gbps Network Interface Cards (NIC) with all of our Dedicated Servers to provide excellent throughput. Chat with our Technical Sales Team to discuss your bandwidth needs. With root access you can potentially install any valid licensed software on your Dedicated Server. Our CentOS servers are provisioned with LAMP stack and come with cPanel / WHM FREE providing a secure and customizable web hosting platform. Furthermore, we offer optional Remote KVM access to enable Lights-Out Management (LOM) capabilities on your Dedicated Server. Our servers, network and Data Centers are monitored by our own system admins both on-site and remotely 24/7/365 days a year. Our servers support an unlimited number of websites, parked domains and sub-domains. 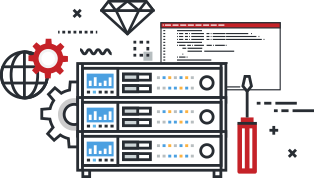 There are no artificial hardware performance limitations imposed on our Dedicated Servers. Chat with our Technical Sales Team about what they recommend for your site. The best backup solution we offer for our Dedicated Servers are large capacity HDD drives that can added for a low monthly fee as a backup drive to store your local backups. Save time and have our APS team setup the WHM automated backup options to send the backups to a 3rd party storage solution of your choice. Or use our Managed Hosting Team script a unique backup solution to cater to your needs. For more details chat with our Sales team. There are two options: One, you can add each domain and website directly through your main cPanel and all sites would be hosted through the primary cPanel. Two, you can create account packages through WHM and add domains and websites to those packages creating a separate cPanel for each new website. The choice is yours. Our Managed Hosting team also provide services to accomplish this task for you. For more details chat with our Sales team. What type of RAID do you offer with your servers? All of our Dedicated Servers have optional Software RAID configurations available. Our Elite and Commercial Class Line of Dedicated Servers come pre-installed with high performance Hardware RAID cards to provide excellent data parity, performance, and multiple RAID configurations to support a wide array of options while allowing better data recovery than Software RAID in the event of a drive failure. Chat with our Technical Sales Team to discuss a RAID solution that meets your needs.